Do you tweet? If your answer is yes then you might want to spice up your Twitter profile background by adding a spicy theme from your follower's profice pictures. 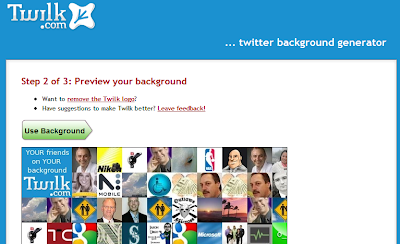 By using Twilk, you can generate cool collage of your followers pictures and use it as Twitter background theme. All you have to do is visit Twilk, Login to your twitter account, allow Twilk to access your profile, and viola! you have a ready to use Twitter background.